Being a doctor requires you intensive skills to keep a patient. It is indeed a crucial work, where you have to carefully watch, listen, and observe whatever your patient is going through to cure the disease, or lessen the pain, or to keep it simple, keeping your patient healthy. Analysing one’s health always starts with proper diagnosis. Be it on the skin, the muscle, or the whole physical body itself. To know what’s going on with your patient requires you to take a deep view of what is going on your patient’s body. Auscultation is just a part. Auscultation, like any other kind of diagnosis, is critical. As a doctor, you should be able to perform accurate and precise auscultation to deliver better results. Proper equipment is essential with accurate auscultation. A good stethoscope will deliver you better performance. ADC Adscope 609ST stethoscope is one of the best stethoscopes in the market. Read more to know more about ADC Adscope 609ST stethoscope. 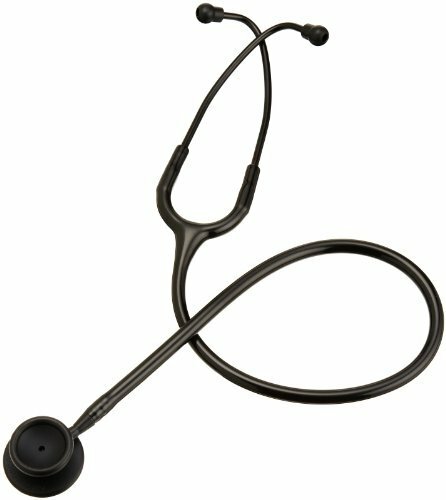 The ADC Adscope 609ST stethoscope is one of the most affordable and durable stethoscope available in the market. This stethoscope is ultra lightweight, and is designed to provide accurate response among patients. ADC Adscope 609ST stethoscope features a dual head, a combination diaphragm and bell adult chestpiece, an extra 1.38 inch bell, a highly sensitive 1.75 inch diaphragm, a non-chill bell and diaphragm retaining ring, a clinical headset with reinforcing yoke moulded to tubing, a flexible 22 inch PVC tubing, a lightweight aluminium binaurals with satin finish, an Adsoft Plus snap on silicone ear tips, and a spare of Adsoft ear tips. This stethoscope is considered 100% latex free. Its total weight is 3.5 oz and its length is about 31 inches. This stethoscope is inspected, and packaged in United States of America. As per purchase, you will be given a five (5) year warranty. This product is perfect for doctors and nurses who wanted to have a light stethoscope to use, while able to perform accurate auscultation. Also, to doctors and nurses who wanted to have the comfort upon auscultation. In every product, there is always the good side, from which, customers came to appreciate. In this article, let there be an unbiased delivery of what this product can do and what to expect about this product. Let yourself have an insight of the plus you get upon purchasing ADC Adscope 609ST stethoscope. ADC Adscope 609ST stethoscope is affordable. That’s a big plus-plus to every doctors and nurses who wanted to purchase a stethoscope. Most sellers online sell ADC Adscope 609ST stethoscope for only $21.82 completed with freebies. Also, this stethoscope is lightweight, so you can bring it anywhere. Having it so light can lessen the stress of bringing your stethoscope to literally, anywhere you go. You can keep this equipment for emergencies and rainy days. This stethoscope is pretty sturdy and durable for its price, it is like a cheaper Littman’s, as stated by Freddy Pacheco (2012), who had made a purchased in year 2012 on Amazon. Most of the customers who bought this product claimed that the sound quality is audible – some even stated that this stethoscope provided better heart sounds. Karen Bribriesca (2014) had made a purchase of this stethoscope as well, on Amazon. She claimed that the sound quality is good, after giving this stethoscope to one of her students who came running into her telling her that he/she can hear so well. Karen even stated that ADC have good quality stethoscopes. Medic (2014) even compared the quality of ADC Adscope 609ST stethoscope to Littman’s. He happened to purchase quite expensive stethoscopes throughout his practice, believing that, expensive stethoscopes will provide him accurate auscultations. But, due to some instances, he came to purchase ADC Adscope 609ST Stethoscope and put it into use. To his surprise, this stethoscope delivered him high quality heart sounds, as to what he claim, almost similar to the quality of sounds delivered by Littman’s. Cly (2014), is another satisfied customer upon purchase of ADC Adscope 609ST stethoscope. He was in need of a replacement for his Littman classic 2 SE, so he came to decide to purchase a stethoscope from ADC, as it only requires a small amount of money to purchase one. Upon using the stethoscope, he was very astounded to hear good quality heart sounds. And from that, he considered this stethoscope as good replacement for Littman’s. Nicole Heinz (2014) came to appreciate ADC Adscope 609ST stethoscope a lot. She was always complimented of how sleek it looks, and of course, of the quality of her auscultations. She was a very proud user of this stethoscope. She can hear clear and loud heart sounds. After all this sunshine reviews, let’s get into the downside of this product. You might now be expecting too much, so let’s discuss what others think of this stethoscope as well. Some commented that the ADC Adscope 609ST stethoscope is too short for them to use. They claim that it is not too lengthy, and that they are sometimes having a hard time in performing auscultations due to its length. Junior 5 (2011), who happened to make a purchase of this stethoscope, was not that all giddy upon setting this stethoscope in the field. He claimed that ADC Adscope 609ST stethoscope does not deliver clear heart sounds. From that experience, he stated, this stethoscope is not good for beginners; beginners should opt to buy a more sensitive stethoscope. Richard Arms (2011) was not that satisfied with this stethoscope and had given it a rating of three (3) stars. He claimed that this stethoscope definitely looks good, and does well in auscultations indoor. But, when used in emergency situations, like using it on an ambulance, he claimed that this stethoscope is pretty much a junk. He does recommend this stethoscope to students, but not to his fellow EMT. Jannet (2014), bought this stethoscope for veterinary use. She claimed that ADC Adscope 609ST stethoscope does deliver good heart sounds when she uses it to listen to her heart. But when she uses it to perform auscultations on dogs and cats, the stethoscope cannot deliver better sounds. She then came up with not recommending this stethoscope to her fellow veterinarians. The ADC Adscope 609ST stethoscope is a great choice if you happen to be an experienced nurse or physician who wanted to save money and do not want to invest too much in purchasing a stethoscope. Yes, experienced nurse or physician. Also, this is a great deal to nurses and physicians who wanted to have a lightweight stethoscope. The ADC Adscope 609ST stethoscope was recommended for human auscultations. So if you happen to be a veterinarian, this stethoscope is not a good one for you. The ADC Adscope 609ST stethoscope performs better when performing auscultations in humans. In making a purchase, the deal is always up to you. You can try ADC Adscope 609ST stethoscope to experience the stethoscope first hand. Yes, you can still rely on other people’s review upon deciding what to buy. But, the experience of using the stethoscope weights up technically everything.